It wasn’t a total surprise, but exciting nevertheless for bicycle advocates gathered at the NACTO “Cities for Cycling” Road Show in Oakland last night. Caltrans Director Malcolm Dougherty announced that the agency will endorse the use of the National Association of City Transportation Officials Urban Street Design Guide, giving California cities the state DOT’s blessing to install modern infrastructure like protected bike lanes. NACTO’s Urban Street Design Guide, launched last September, is the product of collaboration between the transportation departments of its member cities around the U.S. The guide provides the latest American standards for designing safer city streets for all users, incorporating experience from cities that have developed innovative solutions into a blueprint for others to use. It supplements, but doesn’t replace, other manuals such as the Caltrans Highway Design Manual and California’s Manual of Uniform Traffic Control Devices. As the state’s transportation department, Caltrans has control over the design of state-owned highways, but the design of local streets and roads is left to local jurisdictions — with one exception. Bicycle infrastructure throughout the state has been dictated by the car-focused agency because local engineers rely on Caltrans-approved designs to protect local municipalities from lawsuits. As a result, city planners were often hesitant, or flat out refused, to build innovative treatments like protected bike lanes that don’t appear in Caltrans Highway Design Manual. “It’s a permission slip for cities, for engineers and planners, to do the good, well-vetted, proven work that we know we can do to make our street safer,” said Ed Reiskin, president of NACTO and director of the San Francisco Municipal Transportation Agency. “It’s only a first step — ultimately, we’d like to see the changes in the Highway Design Manual to see it actually integrated into Caltrans documents. But this is a huge step forward, and great leadership from Malcolm, Secretary [Brian] Kelly, and Governor [Jerry] Brown,” who commissioned a report that recommended Caltrans adopt the NACTO guide. The guide includes design standards for infrastructure including bike boxes, physically protected bike lanes, contra-flow bus lanes, and even parklets. Although these improvements have been implemented in cities in California and the world, they have been considered “experimental” until now. The NACTO guide has only been endorsed by two other states, Washington and Massachusetts. “Endorsing NACTO basically says this manual can be used alongside the Highway Design Manual and the Manual of Uniform Traffic Control Devices as an appropriate reference when you’re looking at possibilities for new street designs,” said Dougherty. 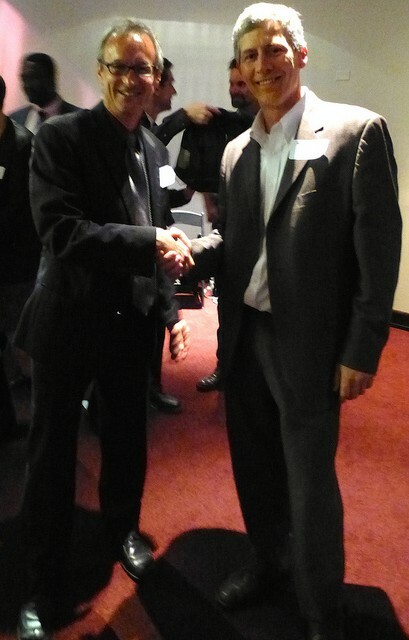 Caltrans Director Malcolm Dougherty (right), CalBike Executive Director Dave Snyder. Photo: Robert Prinz, Bike East Bay. Develop a new mission statement: Check. Modernize state transportation design guidance by endorsing the NACTO urban design guidelines: Check. Work to ensure success of S.B. 743, which calls for Automobile Level of Service to be replaced with transportation planning metrics that better accommodate the needs of all street users: Dougherty says meetings on this effort are currently in progress. Organize teams to develop action plans and performance measures: eight teams have been formed and are in the process of being staffed and readjusted. Aaron Bialick contributed to this report. Fantastic news and an important precedent for the US! State DOTs have long been bastions of auto-centric planning and thinking, so the fact that the biggest state DOT in the country is getting on board with the NACTO design guide is huge. There is still a LOT of work to be done, but a major obstacle is now out of the way. Thank you, all you livability and bicycle activists, thank you for this. If anything deserves a ‘YAHOO’, this does. I don’t understand why it only applied to bikes – why didn’t the same liability concerns also restrict street and road design? Was there something in the law that made bike infrastructure more vulnerable to law suits? Or was it just a matter of degrees? The fact that the director of Caltrans considers walking an “alternative mode” speaks volumes. You could argue that everything that isn’t walking is an “alternative mode”, because walking (or rolling a wheelchair) is the one transportation mode that everyone has available to them. I have written here my detailed concerns about the many flaws with the NACTO guide. I will not repeat them all again. Suffice it to say, any guide is profoundly defective if it endorses door zone bike lanes where the most dangerous place on the entire road to ride a bike… is in the bike lane. Well, I guess that a lot of bureaucrats got to have expense account travel and meals and meetings as they re-invented the wheel. And got it wrong. For a lot lower cost they could simply have taken off the shelf the Dutch world-class CROW bicycle traffic design engineering standard. Which is totally plug and play. Just implement the CROW standard and watch your city transform itself. And become a city for people, not cars. The consistency of this standard of excellence is why Dutch cities all have excellent infrastructure and high cycle mode shares. We have a choice. We can adopt the world-class proven design engineering standard that has a consistent track record of success. Or not. Does anyone on here have access to CROW? I’d like to see it and spread it around indeed. The NACTO guide is flawed. It still promotes door-zone bike lanes as an acceptable solution, and offers no protection options for intersections. This is bad news for California. CROW considers standard Dutch road traffic laws (where, as in the rest of Europe, for instance, there is no right-turn-on-red by default; 4-way stops don’t exist; roundabouts are extremely common etc.). It is *not* a plug-and-play manual that could be readily adopted without cumbersome adaptations. So what, precisely, is stopping the implementation? New York has plenty of no right on red intersections. This leads to the prediction that the sky will not fall if it becomes universal. There are also plenty of 2-way stops. Again, replacing 4-way with 2-way (which they almost all used to be in the first place) is not a big deal. I am really not seeing any “cumbersome adaptations” whatsoever. The great thing about CROW is its ease of implementation. All the hard work of design engineering has already been done. The only thing we have to do is take it off the shelf and implement it. Just don’t look at their intersection designs! Horrible! I am not sure how you think this is bad news. California had “door-zone bike lanes” for the last 20+ years, and we still have them (I personally think, and the Cambridge study shows, that “door zone bike lanes” are safer than the same street with no bike lanes.) As the article states, Caltrans acceptance of NACTO does open the door to protected bike lanes and bike boxes. Things we didn’t have before. I think that’s good news! And we still have a lot of work ahead for truly safe streets. Good man! And great photo in the news you took at NACTO. That was great news, huh? Which city can we get to use it first, huh? Not only does NYC have roundabouts, but they’ve even implemented protected bike lanes on them in a nearly Dutch way on at least the roundabouts at Grand Army and Prospect Park Circles. Besides the doorzone issue, NACTO utterly fails at the intersection issue. CROW is indeed the way to go. How likely is it for a California city to be able to “experiment” with CROW-like designs for things such as protected intersections? Hmmm… I’m no where as critical with the NACTO Bikeway Guide as some. While I still agree that door-zone bike lanes are not good, I’d be more concerned with Bike Boxes that I still believe are in there. Also, does NACTO cite any empirical evidence on the safety superiority of left side bike lanes on one-way streets? Nope! Not last I checked. The NACTO Bikeway guide is great start but I will need to see more independent evidence before I can agree with some of the design solutions in there. Yes, bike boxes are an example of a (usually) subpar solution to a problem that’s (usually) better fixed by other means. Bike boxes are especially egregious when used on busy arterials that otherwise have protected lanes midblock but abandon the protection come intersection. I really look forward to the day NACTO endorses protected intersection treatments. I’d love to see the CROW manual adopted by agencies too, but the NACTO isn’t as bad as people are making it out to be. The CROW manual does include treatments that could be misused, including door zone bike lanes. Both treatments V15 and V16 (cycle lanes) in the CROW are allowed next to parking in conjunction with V11 (critical reaction strip) which is not wide enough to truly protect against an opening door. It’s not uncommon to find door zone lanes all over The NLs and while many likely are older and slated to be upgraded, they still exist and theoretically could be used again. There are three major difference between the CROW and NACTO. First, the CROW is more than just a design manual, it’s a summary of decades of research. While the NACTO is also based on research, it doesn’t include the narrative justification for everything nor the references like the CROW does. The second difference is that the CROW includes guidelines for separation. There is not a cycletrack beside every single Dutch road. Many roads carry combined traffic, with a decent amount of those being converted into bike boulevards. 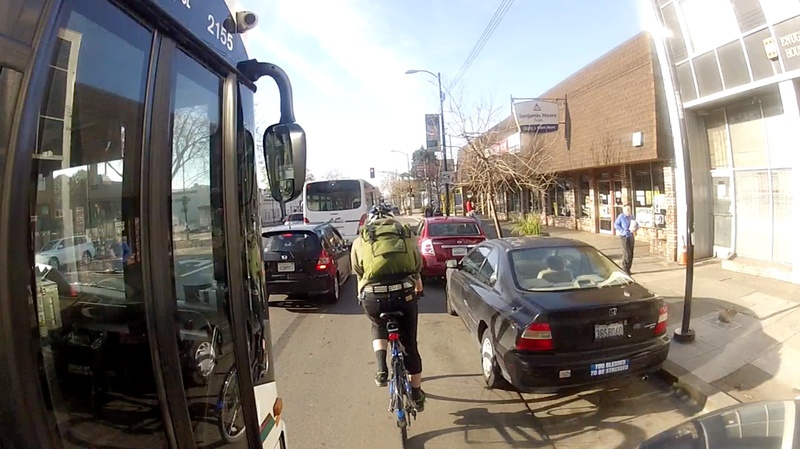 Many more just have good ‘ole (Class II for us Californians) bike lanes. The biggest major difference is with intersections. The NACTO still does stuff like throwing bikes in the midst of right turn pockets with nary any protection and generally takes a cumbersome approach. The Dutch use far more roundabouts and this is reflected in the CROW, with most having a cycletrack around the perimeter. When roundabouts aren’t used, bike-specific signals await riders at many intersections. But great pains are usually taken to just completely separate bikes from the roadway altogether. Dutch bike intersection treatments have two goals: keep bikes from stopping or minimize the time that they stop when they must. As a significant number of intersections in the country are completely unsigned or unsignaled, assigning right-of-way is done via the infrastructure. The NACTO makes mention of many of the same treatments, but not quite as concisely or clearly. It takes a person familiar with how they should look and function together to be able to realistically apply them. Just because they’re all in the book doesn’t mean they can just be thrown out with gusto all over the place, and that goes for both the CROW and NACTO. That’s where we come in. It sounds like you’re decently familiar with the CROW. I’m sure we’re far from the only ones as even the NACTO makes mention of the CROW. What that all means is that we have a duty to make sure that quality infrastructure comes out of any planning, whether for new-build or redevelopment. Many people in the past have been concerned that bikes would end up being restricted to substandard (and dangerous) infrastructure. While that could be open for debate for years to come, what’s not debatable is the need for good quality infrastructure, the likes of which are generally lacking. Most agencies conceivably could use the CROW manual in basically a plug-and-play fashion. The CROW manual is a toolbox, just like any other manual. The vast majority of the stuff is in the CROW is in the NACTO too, so in essence, they contain the same tools. But the CROW comes with the equivalent of building instructions in addition to the tools, the NACTO does not. Scores of studies are cited as the justification for various treatments and decision processes, with the most important (at least in my view) being the requirements for when to combine and when to separate bikes with autos/peds. All that is lacking from the NACTO. “Differences” between American road practices and Dutch aren’t insurmountable, especially given the American propensity to sign or signal everything. (Right on reds are basically a non-issue, especially with the preferred CROW treatment of bending paths away at intersections.) If anything, American takes on it would be safer than the Dutch have been. The CROW Dutch bicycle traffic design engineering standards explicitly discourage (“expliciet ontraden”) putting a bike lane next to parked cars. Where this absolutely must happen, there is a minimum buffer zone (“schrikstrook”) of 75 centimetres between the car parking and bike lane to protect people from the door zone. NACTO does not explicitly discourage putting a bike lane in the door zone of adjacent parked cars. Nor does it mandate a schrikstrook (literally “fright strip”). This gives the result that the most dangerous place on the entire road to ride a bike is in the bike lane. That’s definitely true, but it’s a tad misleading to, say, only 5% (or whatever) of streets in the Netherlands have a cycletrack. Of course numberwise they constitute a minority of all streets in the NL but they’re along the most important routes (esp. arterials). Just like freeways will never be the numerical majority road for autos but have disproportionate importance for car travel. Yes, though even there there’s quite a difference between a Dutch shared-space street (whether an official fietsstraat or not) and an American Bike Blvd. Having lived in the Netherlands and now back in the US the difference is painfully clear. Just yesterday I was verbally and nearly physically harassed by two separate drivers within 10 minutes on a Bicyle Blvd in Berkeley even though I was doing nothing wrong. Because American Bike Blvds are often just wide suburban streets marked as a bike route and only rarely have physical barriers or narrowing along the way the entitlement of drivers continues as ever. Many drivers have no clue about what they are. Of course driver education is a part, but there are few infrastructure cues (besides stencils and signs) to indicate their existence, either. Those are common enough in the NL but the crucial difference is they are much less commonly allowed between parked and moving cars. And as you point out, where those lanes do exist they’re likely slated for upgrades. I don’t think anyone thinks we can or should just copy-paste CROW wholesale but it certainly has a lot of things that can apply to infra in the US. Almost splitting hairs, but distance means the difference between dooring or nah. CROW specifications for V11 strongly encourage 0.75m, but only a minimum of 0.50m is required. While vastly superior to the status quo, I can easily imagining many implementations here going with the 0.50m or less because there’s “no space”.